CT Painters specializes in interior and exterior painting for residential and commercial buildings of all types throughout the Southern CT and Fairfield County area of Connecticut. We have been providing customers with quality work, affordable prices, and 100% customer satisfaction for more than 30 years. 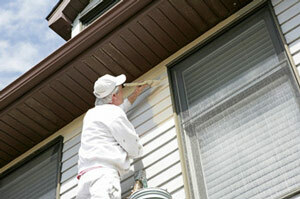 When it comes to painting your house, there’s more to it than just applying paint. As a local professional painting contractor, our experts offer the training, experience, and products to provide you with long-lasting results that will help your CT home look its best! Professional Reputation – With over 30 years experience painting homes and businesses in Fairfield, Milford, Stratford, Greenwich, our solid reputation has earned us an A+ rating from the Better Business Bureau. Experience and Training – Our professional painters have the experience and training to help you choose the best options for your interior or exterior painting project, and they will answer any questions you might have along the way! Locally Based – Because we are locally based in Monroe, CT, we are able to provide our customers with personalized service and can offer customized painting solutions that will work with your home or office. Just read our reviews to see what previous customers had to say about us. High-Quality Paint and Materials – We use only the highest-quality paint and materials, keeping in mind things like appearance, moisture and mildew resistance, durability and stain resistance, and environmental and health factors. This house was sanded, primed and oiled before being painted with a beautiful finish. This older 1800s era home needed to be refreshed. Peeling paint and dark trim was made to look more modern with a fresh coat of paint, while still retaining the historic charm of the home. We applied this Sikkens Stain on a house in Oxford, CT. This home's exterior was sanded, primed and painted in Chappaqua, NY. This home in Bridgeport, CT was done in a yellow color with pastel base paint. Stripes blue-red and gray to deck out this store's exterior! We painted this fireplace with a red accent wall. These walls went from wood paneling to white. This nice sunroom changed from pink to blue paint. We finished this deck staining at the back of the house. We prepped and painted this home. We painted the interior of this home. We painted these beautiful French doors. This home was painted before selling the house. It was very affordable and it just freshens up the home for prospective buyers. Whether you are looking to paint your living room, bathroom, office, or the outside of your home or commercial building, CT Painters specializes in cost-effective painting services that will create a more attractive look and increase the value of your home or building. Our company offers residential and commercial, interior and exterior painting services in Fairfield, Milford, Stratford, Greenwich, Trumbull, Westport, Ridgefield, New Canaan, North Haven, Guilford, Darien, Southbury, and surrounding areas. Contact us today to setup a consultation and Free Estimate with one of our licensed, professional painting contractors in CT.